Scientists have identified over 100 different cannabinoids in the cannabis plant, but the ones you’ll most commonly hear about are delta-9-tetrahydrocannabinol (THC) and cannabidiol (CBD). Exogenous cannabinoids, meanwhile, aren’tproduced by the body but can be found in marijuana as THC, CBD, and a variety of other compounds. Why does THC get you high while CBD doesn’t? 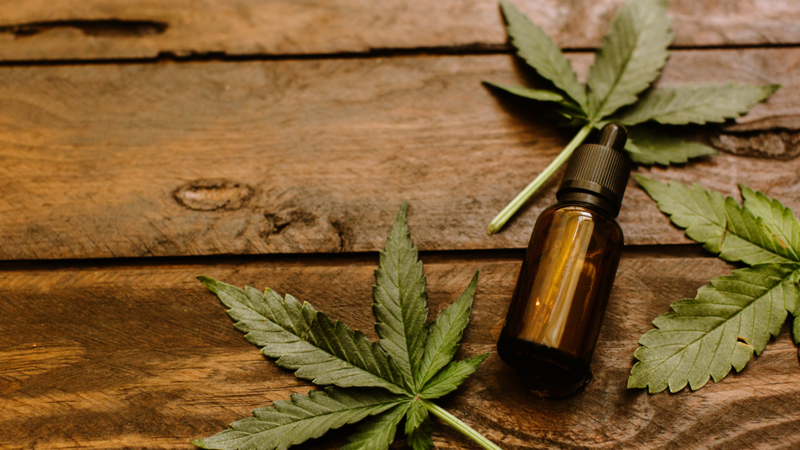 This part gets complicated, but what you need to know is that THC tends to interact with the parts of your body that makes you feel “high,” while CBD tends to interact with the parts that reduces inflammation. Jeffrey Raber, CEO of California-based cannabis chemistry lab The Werc Shop, says that although CBD and THC have the same atoms, they’re rearranged very differently. “Because of that, it’s a wildly different key going into the lock,” Raber said in a phone interview. It’s a lot of confusing phrases — basically, whatever affects CB1 receptors are more likely to have psychoactive effects because they affect the brain and spinal cord. Whatever affects CB2 receptors will likely affect the rest of your body, reducing inflammation without giving you the “high” feeling that weed brings. THC has an affinity to bind to CB1 receptors: It won’t shut off your breathing or heart like opioids do because it doesn’t affect the brain stem, but it does trigger that euphoric “high” feeling. That’s not to say that THC will exclusively bind to CB1 and CBD will exclusively bind to CB2. “It’s not like this molecule only reacts with that receptor, and it’s only going to do its thing,” Raber clarified. CBD may still react with CB1 receptors and THC may still react with CB2 receptors, but both are way more likely to interact with the reverse. And most CBD products, whether a tincture to help you sleep at night or a shot of oil in your smoothie, won’t get you high if it’s hemp-derived because hemp products cannot legally be sold if they contain a THC content higher than 0.3 percent. Anecdotally, cannabis consumers report less feelings of anxiety and paranoia when they consume products with both THC and CBD, as opposed to products that contain just THC. In one study in the Journal of Psychopharmacology, participants who were given CBD before they were administered a dose of pure THC experienced less cognitive impairment and paranoia than participants who only received pure THC. Wireddescribes CBD as an “antidote” to weed freak outs. “In a basic sense, the two together act differently than when they are used by themselves,” Raber explained in an email. He says that one or both of two actions can happen: receptors can be activated differently, and/or CB1 and CB2 receptors can change. Essentially, the pathways that your cells communicate through change — if THC and CB1 interact less, you’ll experience less psychoactive effects. The presence of CBD, for some reason, makes you feel less high. That still leaves a lot unexplained, but as High Times notes, there’s so much more to be studied about cannabis and the brain. Raber says CBD can interact with over 60 receptors in the body, and its full potential is yet to be understood. All marijuana technically has both THC and CBD, but decades of curating plants without understanding CBD’s potential means that weed tends to be very high in THC. CBD content has been overlooked in favor of weed that’ll guarantee an extreme high. If you tend to get anxious after smoking weed, try out products that have a more balanced ratio of THC and CBD, or are higher in CBD. Hemp and marijuana are both derived from cannabis plants, but industrial hemp can’t be more than 0.3 percent THC to be legal under the 2018 Farm Bill. That means that hemp-derived CBD, which is rarely psychoactive, is legal all across the country regardless of whether or not marijuana is legal in a certain state. That’s not to say that all CBD products will be accessible nationwide. The Food and Drug Administration still considers CBD to be a “drug ingredient” and won’t allow CBD in food or health products. The higher the CBD to THC ratio, the less high you’ll get. Because CBD counteracts the psychoactive effects of THC, you’re more likely to get comfortably stoned on a 1:1 ratio than an 18:1. A 1:1 ratio means that there’s the same amount of CBD and THC in the product, whereas an 18:1 ratio means there are 18 parts CBD to one part THC. That doesn’t mean it’s an exact science, though. Since marijuana is still federally illegal, clinical trials testing THC/CBD ratios are limited, and many of the reviews are anecdotal. If you want to dabble in ratio dosing, it’s pretty much up to you to figure out what works. Also known as terpenoids, terpenes are the oils found in all plants. In cannabis plants, the terpenes can determine the “type” of high you’ll tend to experience, from a more relaxing anxiety-easing sedation with linalool, often found in lavender, to a more alert burst of creativity with limonene, a terpene found in citrus fruits. The cannabis industry often categorizes weed by calling products either a sativa, which are known for more creative, energetic highs, or indica, which are known for “in da couch” calming highs. Hybridssupposedly combine the two sensations. But the differentiation is relatively meaningless; those are botanical categories, not chemical ones. That means that the terms sativa and indica refer to the plant’s shape and physical traits more than what the plant can do for you. If you’re looking for a specific kind of high, you should look at two things: the CBD and THC ratio, and the terpenes present. When they’re all working together, you’ll probably experience a better high than vaping pure THC. Sometimes called the “ensemble effect,” the entourage effect takes THC, CBD, other cannabinoids, and terpenes into account when getting high. The buzzword basically means that the therapeutic benefits of weed are greater when you consume products made of multiple compounds from the whole plant, instead of just THC. The phrase was popularized by a 2011 study that looked into how interactions between cannabinoids and terpenes can be used to treat various medical disorders. Think of it like a cocktail: It’s going to be a much more fulfilling experience. If you include all of the extra ingredients instead of just drinking straight liquor. You’ll probably find these words emblazoned across cannabis product packaging, bragging about how it’s made of “pure” CBD or “full-spectrum” plant. Isolate oils are entirely CBD. It isn’t more potent than full-spectrum oil, although it was previously believed to be; a 2015 study found that full-spectrum CBD oil eases inflammation more consistently than isolate oil does. It gets blurry when cannabis companies label products “full-spectrum,” or “whole plant,” or “broad spectrum.” Although some companies may label products “full-spectrum” if all of the naturally occurring cannabinoids — including CBD and THC — and terpenes from a plant are included, Raber notes that without an industry-wide standard, all “full-spectrum” really means is that there’s more than one cannabinoid present. Cannabis company MassRoots describes full-spectrum and isolate as two different kinds of pasta sauce. While full-spectrum oil includes tomatoes, mushrooms, meat, and the works, an isolate oil would just be made of tomatoes. But until the cannabis industry figures out a way to define what “full-spectrum” really means, there’s little regulation guaranteeing that the product you’re about to consume has more than just THC or CBD in it. If you do live in a state with legal recreational marijuana you can consume CBD products in a variety of ways. It’ll be up to you to decide which works best for you — and at what dosage — so you’ll need to do some experimenting. It’s best to start with a low dose and move up over a few days when you’re starting out. Vaping is also popular, but can result in lung irritation if it’s made of cheap carrier liquids. If you’re going to vape CBD, check out the ingredients before buying any products — cannabis vapes shouldn’t use the same ingredients as nicotine vapes.